"Rätsch's Encyclopedia is massive in scope, exhaustively researched, heavily referenced, user-friendly, authoritative, and beautifully illustrated. It belongs on the bookshelf of everyone with an interest in psychoactive plants--from those with only a casual interest to veteran researchers." "It is a truism in anthropology that virtually all cultures utilize plants and mushrooms for their psychoactive effects. The impulse to achieve altered states of consciousness is universal. 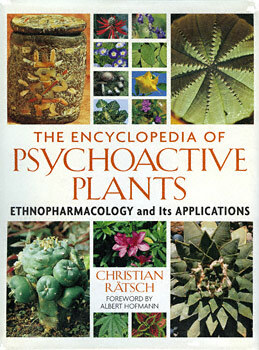 Several previous books on psychoactive plants have become classics on this subject. While valuable historic additions to the library, they must now move over. This encyclopedia is truly destined to be the most authoritative reference on natural psychoactive substances for years to come." -- Mark Blumenthal, founder and executive director of the American Botanical Council, and editor of HerbalGram. "In the realm of psychoactive plants, Christian Rätsch is the world's most knowledgeable person. Here is his magnum opus--a veritable treasure trove of information about the most fascinating members of the plant kingdom. As the "teachers" and the gatekeepers to the spirit world, psychoactives help us cleanse the lenses of perception. No one interested in natural ways to expand consciousness should be without this magnificent volume." -- Ralph Metzner, Ph.D., psychologist, author of Green Psychology, and coauthor of The Psychedelic Experience. "Christian Rätsch's remarkable Encyclopedia of Psychoactive Plants is an essential and comprehensive work that explores not only the expanse of plants that affect human consciousness but the genetic necessity for humans to experience wide-ranging flexibility in consciousness. The plant world is basic to us, the foundation of our food, clothing, and shelter. But Christian's book reminds us that human/plant interactions reach much deeper than these three needs; plant intelligence reaches deep within us and teaches us to see, hear, and understand the deep meanings in the world, meanings that we need, and are meant, to encounter in order to remain human." -- Stephen Harrod Buhner, author of The Secret Teachings of Plants and The Lost Language of Plants.